AVO 01 is an audiovisual sculpture that combines into a monolithic unit a body, digital images and sound. 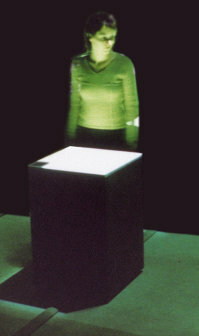 From inside a plain, pedestal-like block of stone, a sequence of minimalist animations is projected onto its surface, covered with a back projection screen. A black picture element moves on a light background and traces the outline of a square—the vectoral rendering of the binary code on which every computer system is based (01, 10, 00, 11)—on the Cartesian coordinate system. This image is supplemented by a synthetically produced acoustic component. The animations, which are based on six possible movement patters and run at six different speeds, derive from the mathematical phenomenon of the combinatory explosion. Here, the combination of a few numbers results in unimaginably huge results: in the case of AVO 01, it would take 126 quintillion years to play the whole composition once.